A number of new party-lists have filed their candidacies for the 2019 midterm elections, in hopes of landing a seat in the House of Representatives. Around 30 groups filed their certificates of candidacies at the Commission on Elections headquarters in just the first two days of filing. Among the party-lists expected to join the 2019 race in the next days are AA- Kasosyo Party-list, an organization that seeks to help overseas Filipino workers and entrepreneurs, and Luntiang Pilipinas, an environmental group. 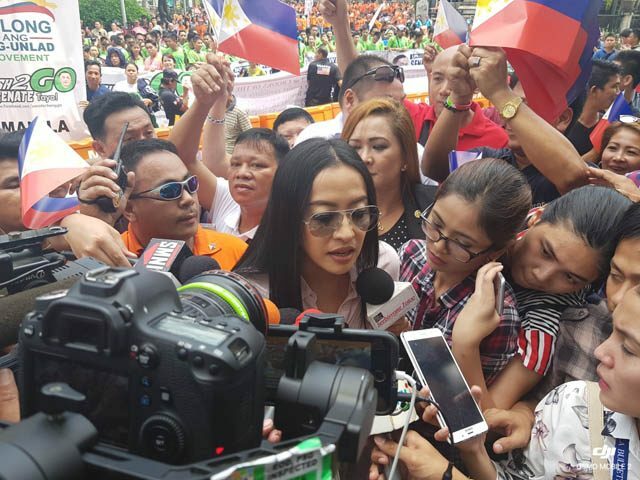 The two groups will be bannered by outgoing Palace officials: former communications assistant secretary Margaux “Mocha” Uson and recently resigned presidential spokesperson Harry Roque respectively. Both were initially speculated to run as part of the ruling PDP-Laban’s senatorial lineup for the midterm polls, but later declared that they would be running as party-list representatives instead. The influx of new party-lists and possible new party-list representatives has been met by the criticism of those who believe the party-list system to has failed, having merely become a vehicle for traditional politicians to be installed in power. The party list system was designed to give voice to the marginalized. It's not to give a plan B for unpopular would-be senators allies of the people in power. These two nominees only prove just how easy it is to abuse the party list system. The party list system was introduced so that marginalized groups can have proper representation, not as a short-cut for those who want to be in Congress. Coming from a family of PWDs, I am seriously dismayed with how the 2019 elections are shaping up. Its implementing law RA 7941 or the “Party-list System Act” defined party-lists as those “registered national, regional and sectoral parties or organizations or coalitions thereof, which will enable Filipino citizens belonging to marginalized and under-represented sectors, organizations and parties, and who lack well-defined political constituencies” to be represented in the legislature. Both the system for computing the number of allocated number of seats for party-list representatives and the definition of who may represent a party-list have evolved throughout the years, due to numerous election contests leading to continuously evolving jurisprudence on the issue. Joaquin Bernas, one of the framers of the 1987 constitution, in a column published in 2012 questioned a number of party-lists at the time. The Supreme Court in 2013 however ruled that the party-list groups did not necessarily have to be from marginalized or underrepresented sectors. Former chief justice Artemio Panganiban was among the constitutional experts who criticized the ruling. Political scientist Julio Teehankee, a member of the Consultative Committee on the draft federal charter, in April 2018, said that the committee wanted to reform the system to its origins as a mechanism to allow representation for economically marginalized and underrepresented sectors. President Rodrigo Duterte, who early in his term called for the abolition of the system, however has not acted on the committee’s draft charter. While a number of elected party-list groups have been questioned in recent years, groups representing marginalized sectors were among the first organizations to win house seats in the early days of the party-list system. Among the urban poor and labor-oriented groups that attained victory in the early party-list polls were progressive workers’ group Sanlakas, which won seats in the 1998 elections, the first elections that included the party-list system, and Bayan Muna, a left-leaning pro-poor and labor party-list that has won seats in every election since 2001.